Ashley received her Bachelor’s of Science Degree in 2011 and her Master’s of Science in Communication Disorders in 2012 at the University of Central Arkansas. While in college, she performed a clinical rotation at MKSA and came on board with us as soon as she graduated. Ashley grew up with a family friend who worked as a speech-language pathologist. After watching her friend work with children all day and make an impact on their lives, she knew she wanted to do the same. 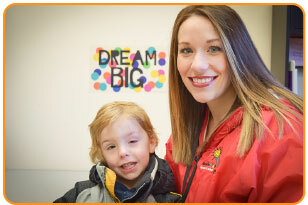 She enjoys working with all children, especially children with Down’s Syndrome and traumatic brain injuries. She loves going to a job knowing she is making a difference in children’s lives. She loves being a positive, loving role model to the kids. Ashley is married with two children. In her spare time, she loves growing in her faith and spending time with her family. She enjoys watching her children grow up, explore and learn new things. She also likes to run for any event that raises money for a special cause. 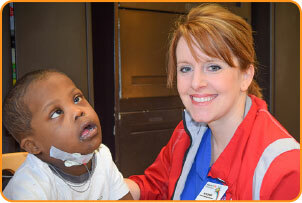 Ashley’s favorite non-profit organization is Arkansas Children’s Hospital. 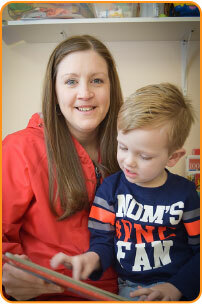 Her husband was born with a congenital heart defect and Children’s Hospital has taken amazing care of him and was proactive in making sure their children did not have the same defect. Pre-chaining and chaining therapy to treat pediatric feeding disorders. Ashley may be contacted at ashleyfrein@mymiraclekids.com. Amanda attended Arkansas State University, where she received a Bachelor’s of Science in Communication Disorders in 2000 and a Master’s of Communication Disorders in 2001. She has been working with children for over 15 years and loves seeing them progress and develop new skills. Amanda enjoys spending time with her family and friends and she enjoys watching baseball, reading and being outdoors. Language Acquisition through Motor Planning (LAMP). an approach that uses motor learning principles and a voice output communication aid to give non-verbal individuals a method to develop independent and spontaneous communication. Amanda may be contacted at amandaglover@mymiraclekids.com. Alyssa graduated from Quachita Baptist University with a Bachelor’s Degree and then attended Missouri State University, where she graduated with a Master’s of Science in Communication Disorders in 2010. After graduating college, Alyssa worked in a public school, but because she wanted to work for a company with a greater focus on therapy and an inter-disciplinary treatment style, she made the switch to MKSA. 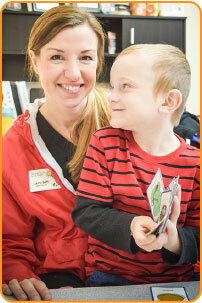 Alyssa really likes working with children who have apraxia and autism because they have so much potential for progress. She loves learning new ways to do therapy and learning about new programs she can try. She wants to have a lot of “tricks in her bag” so she can individualize the therapy to meet the needs of the whole child. She is excited by being able to give words and communication to kids without any means of communication. Alyssa is married with two children. She is passionate about the Lord and serving Him. She enjoys attending church at the Central Baptist Journey Campus. She believes God has gifted her with the skills needed to serve Him as she works with and shows love to the children she treats. She is a part of a ministry at church called Fostering Together, a program that provides support to foster families in the church. Alyssa also supports Families Outreach, an organization that supports families going through the adoption process as well as partnering with orphanages around the world. She has been able to serve them in Haiti and loves how they are helping with the orphan crisis. Alyssa may be contacted at alyssamyers@mymiraclekids.com. Laura received a Bachelor’s in Communication Disorders from Arkansas State University (ASU) in 1997 and then received her Master’s in Communication Disorders from ASU in 2003. She has worked with the pediatric population since January, 2004 and loves this age group. When she heard about Miracle Kids opening (in 2009), she was excited to apply. And we are glad she did! Laura is great with children. She loves to work with augmentative and alternative communication (AAC) devices and provide oral-motor/dysphagia treatment and articulation/language treatment. Laura and her husband, Marty, have two beautiful daughters. In her spare time, she enjoys spending time with her family, running and reading. When asked what super-human power she would possess, if possible, she said, “A perfect memory!” Laura volunteers at her church’s care center, which provides food and clothing to people in need, as well as lunches Mondays through Thursdays. Laura may be contacted at laurariley@mymiraclekids.com. Samantha graduated from Arkansas State University with a Bachelor’s Degree in 2003 and a Master’s degree in Communication Disorders in 2004. She has exclusively practiced in the field of pediatrics since January 2005. 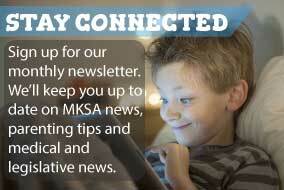 She wanted to work for a company truly passionate about what they do, so she came to MKSA!! Samantha gets much joy watching all children progress and learn new things in therapy, but she particularly love the ages of birth – two. She is most passionate about the areas of oral-motor disorders and language disorders. She loves seeing children succeed and begin to use new words/skills. Samantha is not only great with kids, she has a talent for teaching speech-language pathology college students as well. Samantha is married with two sons, Jackson and Lawson. In her free time, she enjoys reading, shopping and spending time with family and friends. She also loves going to Red Wolf Football games. She is the Chapter Chair for Jonesboro Circle of Friends, an organization that raises money for Arkansas Children’s Hospital. TalkTools sensory motor approach to treating apraxia. Samantha may be contacted at samanthawalker@mymiraclekids.com. Angelina has a Bachelor of Science degree and a Master’s of Science in Communication Disorders. She loves working with children that are facing difficult challenges because she believes that every child has the potential to be exceptional. It is her goal to find each child’s learning style and motivation to help them build the foundation they need to move forward in their treatment. Angelina loves reading and language. She speaks a little bit of Spanish and even a little bit of American Sign Language but has a lot of areas she would like to learn more about. Angelina may be contacted at angelinawood@mymiraclekids.com. Jerri eanred her undergraduate and graduate degrees in communication disorders at Arkansas State University. She sought out employment at MKSA due to her passion to work with children with special needs and watch them grow in language development. She is known for her work with augmentative and alternative communication (AAC) devices using the Language Acquisition through Motor Planning (LAMP) approach. She enjoys showing nonverbal communicators how to use devices in order to express their needs. If she could possess one super-human power, it would be the ability to see the future. She has been certified in Language Acquisition through Motor Planning (LAMP). an approach that uses motor learning principles and a voice output communication aid to give non-verbal individuals a method to develop independent and spontaneous communication. Jerri may be contacted at jerrisparks@mymiraclekids.com. Emily earned her Bachelor of Arts in Communication Sciences and Disorders from Harding University and her Master’s in Communication Disorders from Arkansas State University in 2017. Emily has always had the desire to work with children and to make a difference in the lives of her clients. She particularly enjoys language and articulation therapy. In her free time, Emily loves spending time with her family and friends, being on the lake, hiking, and reading. If she could possess one super-human power, it would be the ability to read minds. Emily may be contacted at emilybarnett@mymiraclekids.com. Hannah earned her undergraduate and graduate degrees at Arkansas State University. She is compassionate and dedicated to helping kids learn and grow. If she could possess one super-human power, it would be the ability to not need sleep so that she could accomplish more in the day! Hannah may be contacted at hannahwarren@mymiraclekids.com.